RonaDeck Resin Bound Surfacing at Westward Ho! 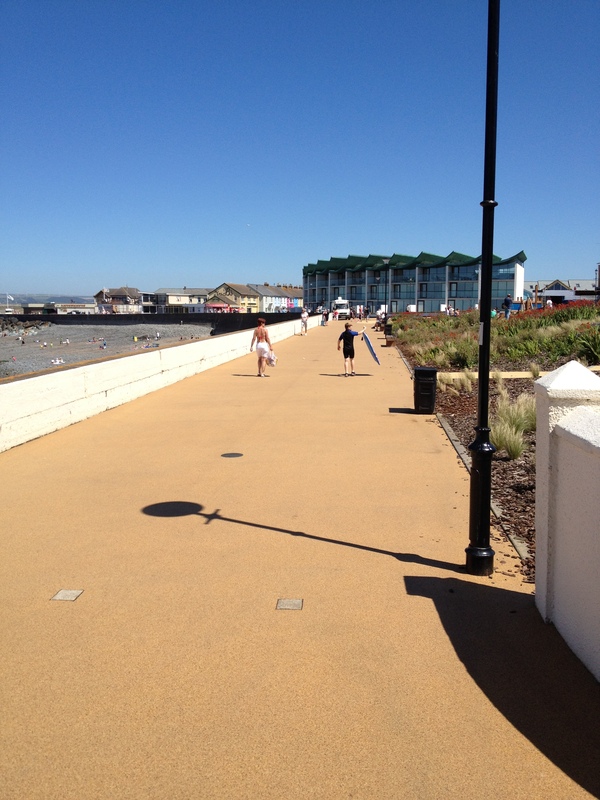 Ronacrete Approved Contractor Avalon Surfacing has transformed the promenade and village green footpaths at Westward Ho! seafront by laying RonaDeck Resin Bound Surfacing, part of a refurbishment project by Torridge District Council. The promenade was surfaced by Avalon Surfacing using RonaDeck Resin Bound Surfacing by Ronacrete, who created two unique aggregate blends for the project. A golden aggregate blend covering 636 square metres and a further 668 square metres of a yellow aggregate blend was laid to the village green footpaths. When Avalon Surfacing were approached by Torridge District Council for samples of aggregate mixes and costings for the project, Avalon Surfacing turned to Ronacrete for assistance and were able to respond quickly with suitable colour suggestions and a favourable pricing structure. The gold and yellow combination gives a warm glow to the area even in the dullest of summer weather a .colourful contrast to the red pirate ship in the children’s play area! The RonaDeck Resin Bound Surfacing system is supplied as a two component UV stable polyurethane resin together with a blend of kiln-dried aggregates for on-site mixing in a forced action mixer. The two resin components were mixed by Avalon with a drill and paddle before being added to the coloured aggregate in a high capacity forced action mixer. As soon as the aggregate was fully coated with resin, the mixed material was discharged from the mixer and trowel applied at a thickness of 12mm onto the prepared surface. The finished system was ready for foot traffic within four hours of being laid. RonaDeck Resin Bound Surfacing is a resin and aggregate mix which creates a hard wearing alternative to traditional paving and comes with a 15 year guarantee when laid by a Ronacrete Approved Contractor such as Avalon Surfacing. 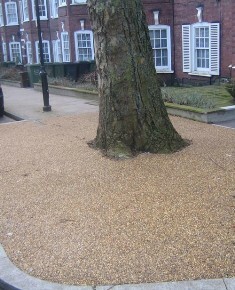 The resin is UV resistant so it will not darken or ‘yellow’ when exposed to sunlight, ensuring that the natural colour of the aggregate does not alter as the surfacing ages. The surfacing is also SuDS compliant, as it has a porous structure which prevents surface ponding of rainwater and will allow water to drain naturally when part of a SuDS* compliant construction. The aggregate provides slip-resistance, while the elasticity of the resin creates a ‘give’ to the surface, meaning that holiday makers and local residents in Westward Ho! can have a safe and comfortable walking experience which is also pleasing to the eye. 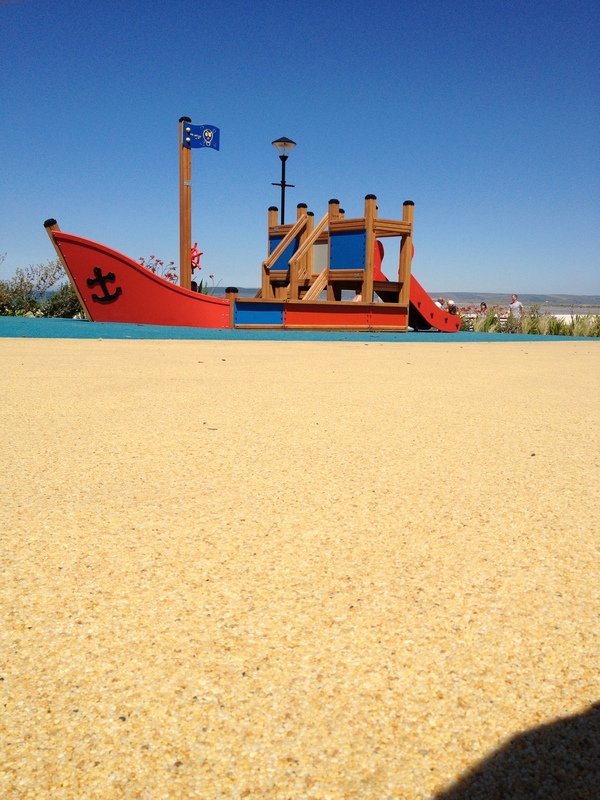 Pirate ship is resin bound at Westward Ho! Tagged aggregate, alternative paving, Avalon Surfacing, decorative aggregate, decorative bonded surfacing, decorative bound surfacing, Devon, pathway surfacing, paving altenative, promenade, resin bound, resin bound aggregate, resin bound gravel, resin bound surfacing, Ronacrete, Westward Ho!